Equestrianism means a range of skilled activities performed by a horse and its rider or driver. The best-known are the competitive sports of jumping, dressage, eventing and endurance. The Horse of the Year is New Zealand’s largest horse show, held annually in Hawke’s Bay. National teams compete – and have been successful – at international events such as the Olympics and the World Equestrian Games. However, the cost of sending horses and riders overseas has sometimes limited New Zealanders’ participation. In the early days of European settlement, both Māori and settlers enjoyed horse riding, racing, hunting and polo. Jumping contests were held at A & P (agricultural and pastoral) shows from the 1870s. A jumping event called ‘round-the-ring’ became popular after the First World War. A national organisation, the New Zealand Horse Society (now Equestrian Sports New Zealand), was founded in 1950. It organised showjumping and horse-trial contests around the country, and aligned New Zealand horse sports with international standards. 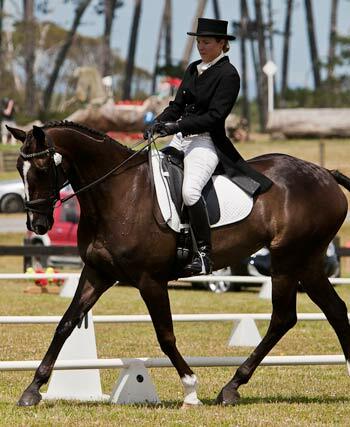 The New Zealand Pony Clubs Association also ran competitions and encouraged young riders. In the 2000s jumping was the most popular horse sport, with around 3,500 horses competing in 2011. Showjumping involves jumping 10–13 brightly coloured obstacles. Show hunter is held on a course of naturally coloured jumps. In dressage, competitors perform a set pattern of movements. Freestyle (Kur) is dressage movements performed to music. Most dressage riders are female. Eventing is a one-day or three-day contest involving dressage, cross-country and jumping sections. New Zealand eventing champion Mark Todd won gold medals at the 1984 and 1988 Olympics on his horse Charisma. Endurance rides have been held in New Zealand since the 1970s. There are two types – endurance and competitive trail riding.